Between “hearing well” and “hearing nothing” lies a wide range of different degrees of hearing loss. Experts distinguish between mild, moderate, severe and profound hearing loss. Most cases of hearing loss are categorized as mild or moderate. Soft and moderately loud noises are not heard. Understanding speech becomes very difficult if background noise is present. Conversations have to be conducted loudly. Group conversations are possible only with a lot of effort. Human speech consists of vowels and consonants at different loudness and frequency levels. 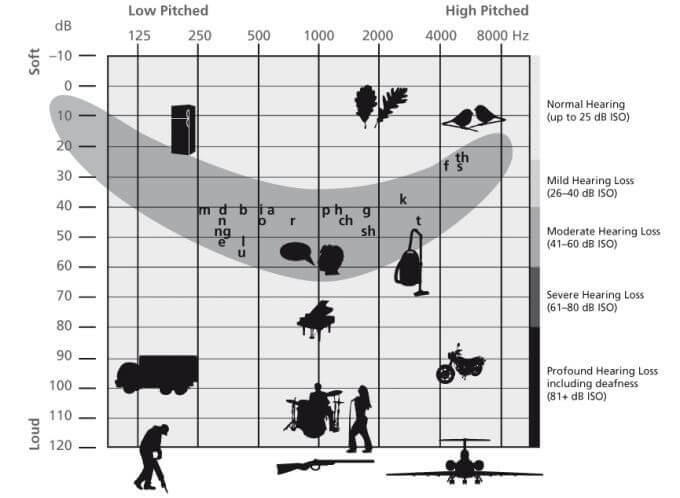 They are recorded on the audiogram as a so-called “speech banana”. It is an easy way to check whether the entire spectrum of speech is still audible and how a person’s hearing changes with time.